My name is Calvin Sinclair, I'm eleven years old and I have a confession… I killed my brother. It's the summer before grade six and Calvin Sinclair is bored to tears. He's recently moved from a big city to a small town and there's nothing to do. It's hot, he has no friends and the only kid around is his six-year-old brother, Sammy, who can barely throw a basketball as high as the hoop. Cal occupies his time by getting his brother to do almost anything: from collecting ants to doing Calvin's chores. And Sammy is all too eager - as long as it means getting a "Level" and moving one step closer to his brother's Eagle status. When Calvin meets Aleta Alvarado, a new girl who shares his love for Goosebumps books and adventure, Sammy is pushed aside. Cal feels guilty but not enough to change. 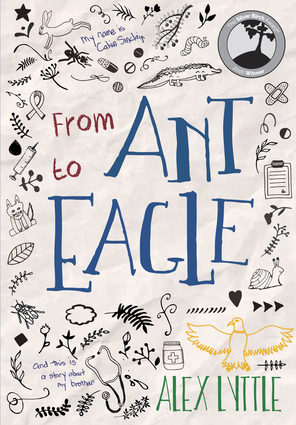 At least not until a diagnosis causes things at home to fall apart and he's left wondering whether Sammy will ever complete his own journey… From Ant to Eagle. Alex Lyttle is a pediatrician living in Calgary, Alberta with his wife and three children. He was raised in London, Ontario - the setting of his first novel, From Ant to Eagle, which he wrote based on his experiences working in the Pediatric Oncology unit. When he is not working, writing or playing basketball, he enjoys learning new magic tricks to perform for his young patients.